sportsmatrix » Which has been the World’s Most Interesting League in 2015/16? Is it really possible to determine which league from all of the leagues from around the world has been the most interesting over the past 12 months? After all what makes one league more interesting than another? How do we decide what is actually interesting? Everyone has an opinion on which has been the most interesting league, but of course this opinion will always be subjective. Looking at Europe’s big five leagues has there been a more compelling and unpredictable league campaign as this season’s English Premier League? What about the German Bundesliga which week after week averages the highest attendances of all other leagues around the world? Whilst after several years of unprecedented success in European competition, three teams are currently battling it out at the top of Spain’s La Liga. But we wanted to measure the volume of standout events (i.e.) highlights during a football game, so to answer that question we turned to our innovative Live Text commentary system to find an answer. The SportsMatrix Live Text system automatically categorizes the events in a game by their level of importance, enabling the user to customize the level of detail which is displayed in the commentary. The lowest level (standout events only) includes an option to follow the commentary for multiple games simultaneously, receiving text updates of only the main events in each game. We removed all non-standout text events from our system from the beginning of the 15/16 season, leaving remaining events such as yellow and red cards, goals, penalty kicks, clear cut goal scoring chances and attempts which posed a significant goal threat. Of course these results don’t in any reflect on the quality of each league; but show the leagues where there were a high number of events which could be described as being of interest. During the current season SportsMatrix has viewed in excess of 12,000 games from more than 50 leagues from around the world, providing full live text commentary, with these games aggregating more than 10 million text events. When examining the top 10 leagues for level of interest what stands out is the presence of five leagues from South and Central America, perhaps suggesting that in this part of the world the football played is more gung-ho with more emphasis on attack, rather than the more rigid conservative playing styles in other parts of the world. Italy’s Serie A (10th) and Serie B (5th) both feature prominently, whilst Spain’s La Liga (ranked 22nd) also had a higher than average number of interesting events. Compare this with the other three major European leagues – English Premier, German Bundesliga and France’s Ligue 1 – all north European leagues and all of which featured a below average number of interesting events. But whilst most of the top 10 leagues feature Latin countries, there are few exceptions with Sweden’s Allsvenskan and the super leagues of Switzerland and India also featuring. As followers of Bielsa and more recently Sampaoli, perhaps the Chilean league reflects the attacking high energy and sometimes aggressive nature of its national side. Chile’s Campeonato Nacional league ranked 10th in the number of clear cut scoring chances per game (3.46), fourth in the number of occasions an attempt was extremely close to being a goal (7.84) and third in the number of shots per game (28.81), beaten only by the Indian Super League (29.55) and the Swedish Allsvenskan (30.50) in this parameter. 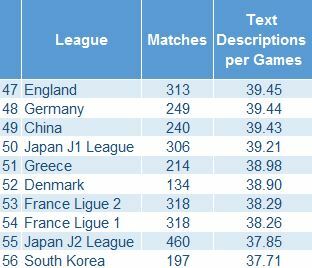 These attacking events resulted in 2.86 goals scored per game, the eight highest number of any of the leagues examined. 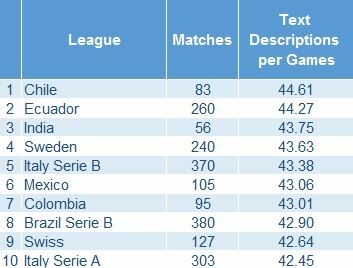 It’s somewhat aggressive nature was evident, with Chile ranked equal first with Ecuador in the number of red cards shown per game (0.49) and fourth in the number of penalty kicks awarded per game (0.36). At the other end of South America, Ecuador averaged only marginally fewer standout events per game, conceding on average more penalties (0.43) per game, slightly more yellow cards and the same number of red cards. The leagues ranked lowly in interest level feature four of South East Asia’s big leagues and perhaps surprisingly three of Europe’s top five leagues. Cultural differences may help to explain the lowly position of the South East Asian clubs, with both Japanese leagues and the South Korean K League showing considerably greater discipline, averaging fewest red and yellow cards and amongst the lowest number of penalties awarded per game. Although featuring as one of the bottom 10 leagues in terms of interesting events, England’s Premier League ranked as average in terms of shots on goal and goals scored, slightly below average in good scoring chances, but above average in events rated as threatening; however with its overall good disciplinary record, the Premier League was below average in the number of disciplinary events recorded (i.e.) red and yellow cards and penalty kicks. Although not in the top 10, Norway averaged most goals per game (3.23), slightly more than both Australia (3.13) and Switzerland (3.10). The Qatar Star League, the Indian Super League and the Dutch Eredivisie were the only other leagues to average three goals per game. Spain’s La Liga ranked close to average, with marginally more goals per game (2.74), from slightly fewer shots than average (24.52); but from an above average number of high quality goal scoring chances per game. La Liga, along with the Segunda (Second League) averaged the fourth and second highest number of yellow cards per game. Italy’s Serie A and Serie B, both featured in the top 10 of interesting leagues, partly attributable to the high number of both red and yellow cards (0.31 and 0.41 respectively per game) shown in their games. Both French leagues had similar disciplinary issues, also averaging a red card every three games. Japan’s J-League averaged fewest red card per game (0.09), with both the Japanese J2 League and Korea’s K-League averaging a similarly low number (0.12). The north European nations averaging the lowest number of red cards included Norway’s Tippeligaen (0.10), Sweden’s Allsvenskan (0.12) and jointly Denmark’s Superliga and the German Bundesliga (0.13). The Japanese leagues also averaged fewest yellow cards per game, with Colombia at the other end of the disciplinary scale, averaging six yellow cards a game. « Which Premier Leagues Teams are Best and Worst from Open Play Crosses?